There's all year interest in the plantings. 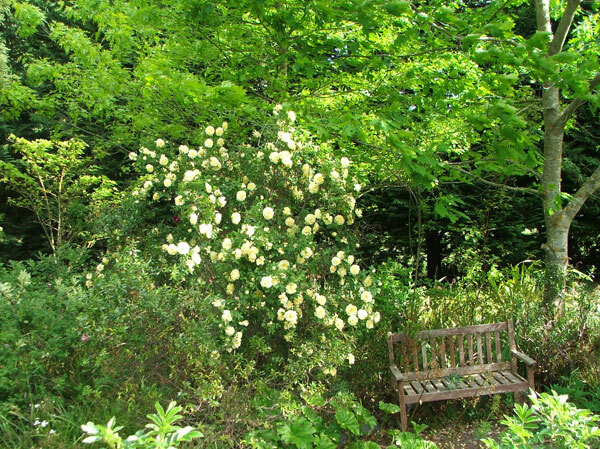 In early spring the waterside Darmera send up flower stalks, then the large Agnes rugosa rose starts blooming. In autumn the Darmera leaves turn the most beautiful shades of golden brown. Over the water there are the permanent shrubs and flaxes in the Glass-House Garden to enjoy. The air is fragrant from spring on with the nearby purple rugosa roses. Much of the area I call the Hen-House Gardens is planted with New Zealand natives, and so the bellbirds spend a lot of time in the overhead trees. And of course there's the gentle burbling water. Actually, I think the placement of this garden bench is rather clever, even if I say so myself. A path here used to lead to the water, but it got rather badly blocked by a Hebe. Rather than persevere and hack a route through I decided to let the path stop and put the wooden bench on it, as a natural destination. I built up a little garden in front with stones and planted golden thyme and some fancy comfrey. So it all looks like it's been here for years. Hee hee.